The Royal High School in Edinburgh welcomed young people from around the Lothian region to participate in the first ever Table Tennis specific event held as part of the School Calendar of Events. The day saw around 40 players of all ages and abilities experience a range of fun skill stations, allowing them to practice a whole variety of shots and techniques. Experienced coaches from Murrayfield and Haddington TT Clubs were supported by ex National Head Coach David Fairholm and were on hand to provide guidance and support to the young people from Prospect Bank PS, Kaimes, Woodlands (all Edinburgh), Cedarbank (West Lothian) and Spark of Genius (East Lothian). 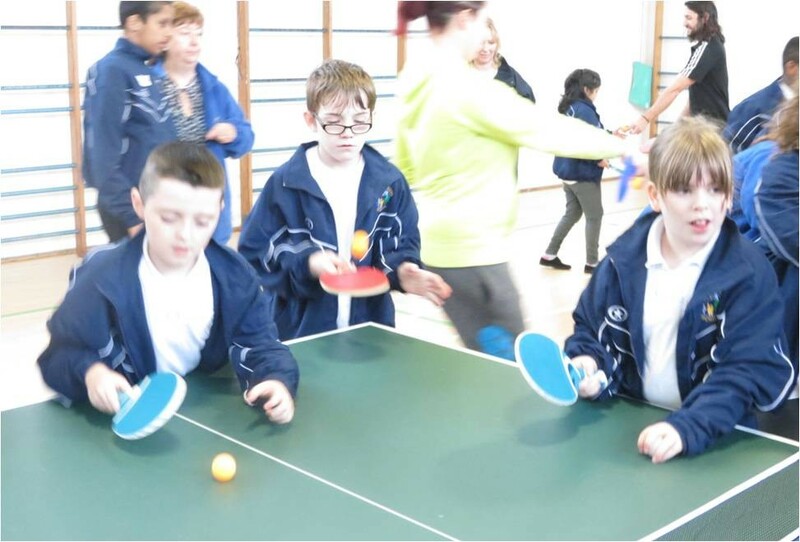 Murrayfield TT Lead Coach, Lindsay Muir highlighted, ‘it’s fantastic to see so many young people having fun whilst playing Table Tennis and we would encourage anyone keen to play on a more regular basis to access the club’. Murayfield TT Club are fully inclusive and welcome players of all ages with a physical, sensory or learning impairment to their club training sessions on a Monday evening (6.00pm – 7.30pm) at The Royal High School. The event was an excellent piece of partnership work between Lothian Disability Sport, Edinburgh Active Schools, the Edinburgh Racquets Development Officer & Coaches, senior pupils from The Royal HS in addition to a whole range of volunteers. This support, coupled with the input from the club coaches made the event a success for the young people and hopefully encouraged some to take up the activity on a more regular basis. We all look forward to seeing everyone next year! Please click here for the Murrayfield TT Club Flyer. The Lothian Schools Swim Qualifier attracted a record number of entries from a record number of schools – with 81 swimmers participating from a very encouraging 20 schools. The swim gala acts as a qualifying event for the Scottish Disability Sport Championships for swimmers with a physical disability or sensory impairment (4th November) and also swimmers with a learning disability (18th November). Times are recorded from the Regional event and a Lothian squad is then selected to represent the region at the National event, giving swimmers the opportunity to test themselves against individuals from other areas of the country. Dalkeith Schools Campus provided the venue for the event and accommodated the gala superbly throughout the day and also during the lead up to the event, allowing all swimmers an enjoyable experience throughout. Further Midlothian support was provided from the region’s Active Schools Team and senior pupils from both Dalkeith and St David’s HS, as Sarah Wright and the large group of young volunteers were on hand to guide swimmers over the course of the day. Additional support from local officials enables the gala to run, without their experience, enthusiasm and significant contribution we would not be able to provide this opportunity for the young people. Swimmers were well represented from all four local authorities with many mainstream schools engaging with the event which is very encouraging as we continue to strive to provide sporting opportunities for young people with a disability. Swimmers attending for the first time are given chance to improve training times, gain confidence and build relationships with their peers while experienced swimmers are looking to qualify for the National Championships, renew rivalries with other swimmers and continue their development in the pool. All swimmers are there to have an enjoyable experience and through this are keen to access further swimming opportunities across the region. 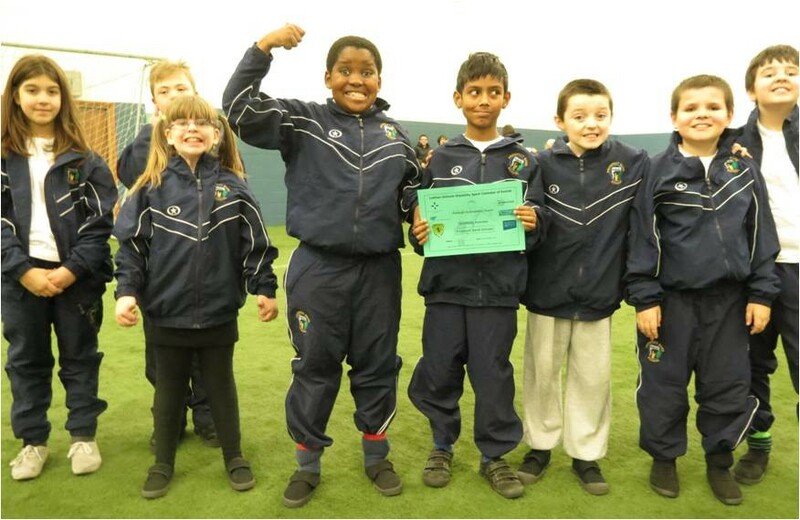 This season's 7-a-side league for school aged players with a learning disability drew to a close on Friday 15th May, with the finale bringing an extremely tense finish for two of the teams involved. The lead at the top of the league had swapped hands on a number of occasions between West Calder HS and Woodlands throughout the season and the scene was set for a gripping finish at Albyn Park, West Lothian. The West Lothian and Edinburgh sides were tied at the top of the league with 21 points after 3 match days and the winners were decided in the very last match of the 2014/2015 season. The atmosphere could have been cut with a knife during the opening 10 minutes of the match as both team knew that it was a 'winner takes all scenario' - and it was West Calder who took the lead, only to be pegged back immediately by Woodlands. However, the teams were only level for a matter of minutes as the West Lothian side stamped their authority on the match and ran out 3-1 winners to take the match and the title. Both teams, as winners and runners up, now qualify for the SFA/SDS National League Finals day, providing the opportunity to test themselves against teams from across the country. 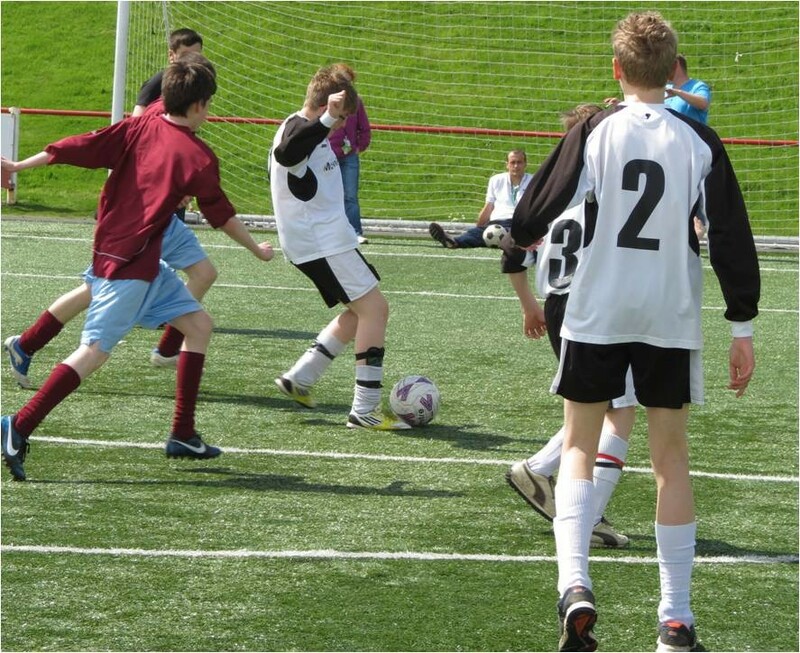 The annual Lothian 5-a-side festival for secondary aged pupils with a learning disability saw a change of venue from previous years, as Portobello Powerleague played host for the first time. The last minute change of venue was embraced by all nine schools entered, with representation from all four local authorities which is again very pleasing. The format of the event remained the same, with six skill stations delivered in the morning session allowing the young people to perfect their passing, dribbling and shooting techniques before putting this into practice after lunch. These sessions were delivered by coaches and volunteers from Street Soccer and the SFA, proving a huge hit with the majority of the young people in attendance on the day. The close partnership working and hard work of Street Soccer and the SFA is crucial to these events, providing the platform for the school pupils to enhance their skills and participate against their peers from across the region. Once again West Lothian College played host to the annual Regional Sportshall Athletics Festival, which saw over 140 young people from across five local authorities register to participate. Following on from last year, pupils from the Borders travelled north to participate and compliment the numbers from the four local authorities. The festival welcomes young people with a physical/learning disability or sensory impairment and encourages children from both primary and secondary schools to come along and try a range of indoor athletics events, such as the javelin throw, standing long jump and shuttle runs and therefore introducing them to the sport. The event also acts as a Regional Qualifier for the Scottish Disability Sport National Event on the 4th March, where a selected team of young people will be given the opportunity to represent Lothian against their peers from across Scotland. Due to the number of young people who continue to attend this event, the day was split into two sessions - morning and afternoon. The event was again supported by students from West Lothian College, who undertake Disability Inclusion Training and an Adapted Sportshall Athletics Worhshop in the lead up to the event. The input from the students is invaluable and this is clearly demonstrated through the positive engagement and interaction with the young people throughout the day. Thanks is extended to Alex McEwan, Athletics Development Officer for WL and Shona Malcolm, Disability Development Officer for Scottish Athletics who continue to provide significant support before and during the event. Also Kelly Keogh, Active Schools Co-ordinator in WL, who helped engage ten schools from the area. The event is a staple in the School Calendar of Events and the engagement from the young people is again very positive, especially in the West Lothian area. Hopefully this introduction to the sport will encourage the young people across the Region to explore further opportunities in athletics and sport on the whole. 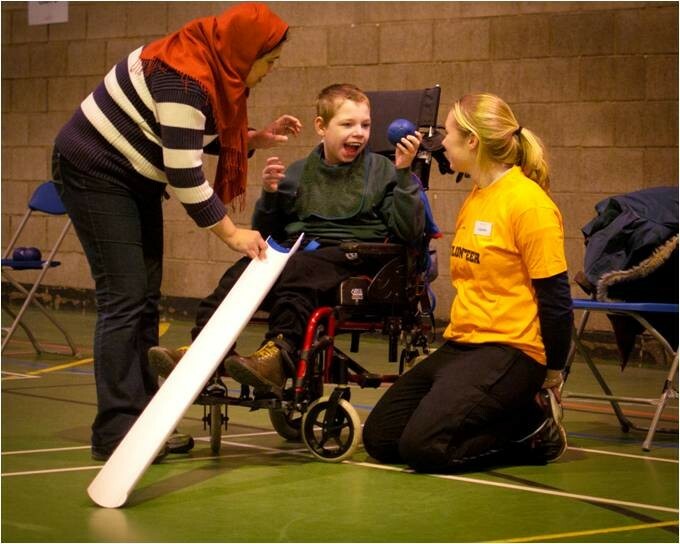 The first event of 2015 on the school calendar of events was held at the Jack Kane Centre on Tuesday 13th January - the Lothian Disability Sport Boccia Festival. The event brought more than 80 young people from across the region to the East of Edinburgh to participate in fun skill sessions during the morning, before progressing on to a slightly more competitive element in the afternoon. Edinburgh Leisure have taken real ownership of this event over the past couple of years and it's great to see such a large team plan, co-ordinate and deliver the festival, which again proved a great success. Heather Williams, Community Inclusion Officer with Edinburgh Leisure again took the lead on the event and has formed some excellent partnerships across the city, with the Edinburgh University Ladies Hockey providing support to the young people and Boccia coaches alike. Edinburgh Active Schools were also present on the day, in addition to encouraging a large school entry from the city, with Kaimes, Oaklands, Braidburn, Pilrig Park, Prospect Bank, St Crispins, and Woodlands all participating on the day. East Lothian were another region well represented with Musselburgh Grammar, Preston Lodge HS and Ross High all enjoying the day. Patrick Wilson provided the young people with a display of top class Boccia, demonstrating skills that have seen the BC3 player progress rapidly through the sports pathway. 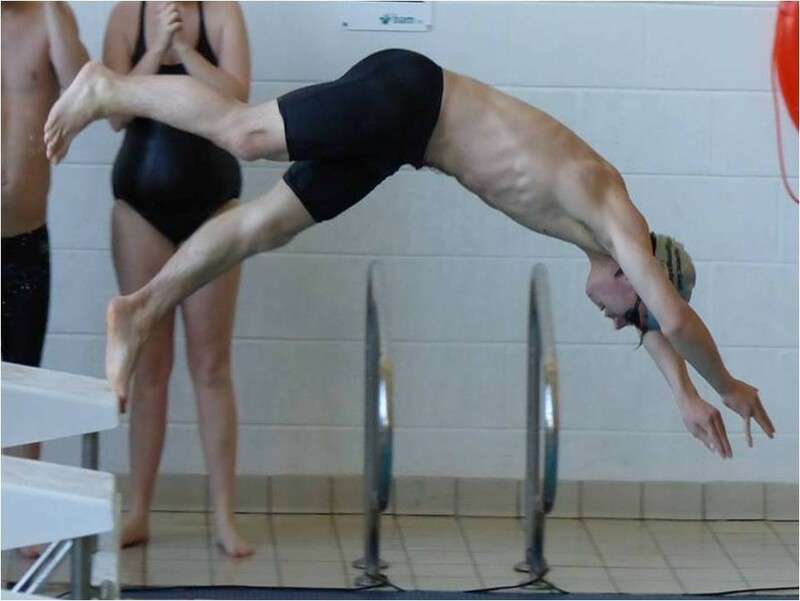 Patrick, who has cerebral palsy, competed in his first SDS Championship as recently as 2011 and is now travelling the world representing Great Britain, competing in Beijing, China in September last year. To view some photo's from the event, click here. All photo's supplied by Tinged Memories Professional Photography. Heriott Watt University Astrodome welcomed a host of young people from Schools across the region to kick off this year's Lothian Football Participatory Event on Wednesday 26th November. Young People travelled from all four local authorities to continue the impressive attendance over the previous few years, with coaches from the Scottish FA and Street Soccer leading and delivering six skill stations in passing, shooting, dribbling and control. This was followed up by small sided games with the primary aged teams from Prospect Bank and Kames (both Edinburgh) experiencing the event for the first time, while the slightly more experienced and older pupils from Woodlands (Edinburgh), Musselburgh Grammar (East Lothian) and Cedarbank (West Lothian) battled it out in the Secondary category. There was also representation from Drummond CHS (Edinburgh) and Saltersgate (Midlothian), taking the number of young people to over 90. Thanks is extended to the coaches from the SFA and Street Soccer and also Heriott Watt University for providing an ideal venue for the young people to develop their skills. Links with the Heriott Watt Sports Union were also established, as they provided volunteers to assist with the event and this is an area the organisers will look to strengthen for next year. Special thank you to Scott Montgomery, Active Schools Co-ordinator for Midlothian, for organising the event. Hope to see you all next year and thanks again for your continued support. For more photo's from this event can be found in the gallery.